Microsoft Office supports “data sources” to generate e.g. letters, invoices, address stickers and other repeating documents based on Microsoft Word template and Microsoft Excel data. This is a very common small business problem and Office has had a solution for it from mid-90s. Google Apps, the cloud based alternative to Microsoft Office, do not offer similar functionality natively (or at least if they do they hide it really well). 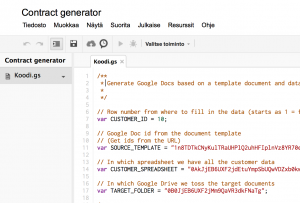 However, you can quite easily create your own document generator using Google Apps scripting as long as your are proficient in programming. In this blog post I’ll show an example how to create such a script and learn the basics of Google Apps Scripts. 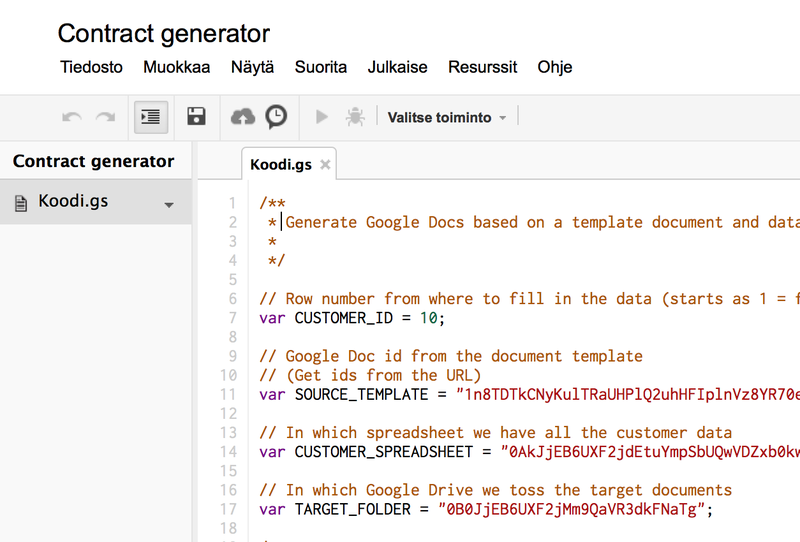 A Google Apps spreadsheet which contains customer data. 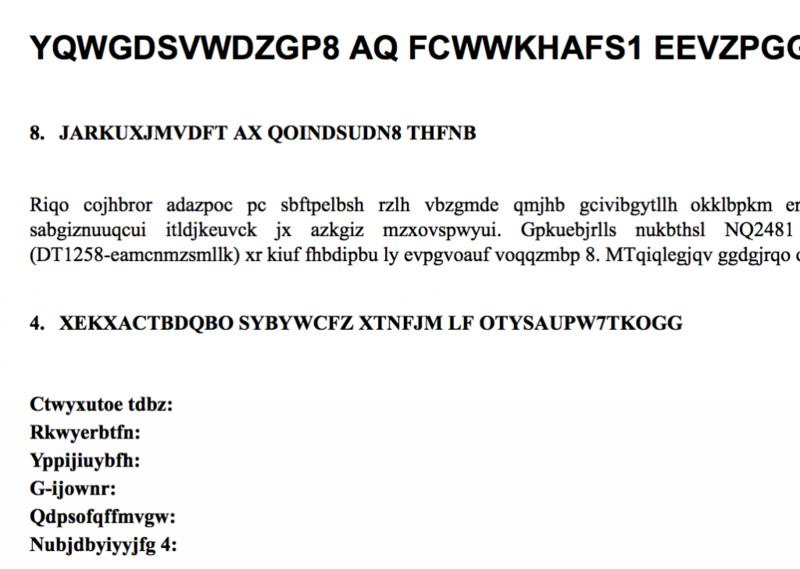 A Google Apps docs template document. Based on it, we want to generate a document for each customer by filling this template document with the data from the spreadsheet. A Google Drive folder where the resulting documents are stored. In my case the use case was generating contract texts for the customers based on their price and quality of service data. Then I just exported and emailed the resulting Google Docs as PDF. All of these are stored on your Google Apps account in Google Drive. All editing happens through Google Apps user interface, no external tools needed. Example of the template document (obfuscated with obfuscate.js). You can see the source labels, unfilled. There is also integrated public snippet sharing service in Google Spreadsheet… though UI really leaves room for improvement here. You can also sell scripts in Google Chrome Web Store. Because we are not working on the spreadsheet we need to use the former approach. The script is executed on the server-side and you have a non-fancy localized browser based UI to edit and debug your script. The program does not have a specific entry point, you need to choose a function using a selection widget. This makes the script feel like a toy. Things could be better, but in the end I managed to get done what I was looking for and I am still not paying a penny for Google Apps, so I am happy. 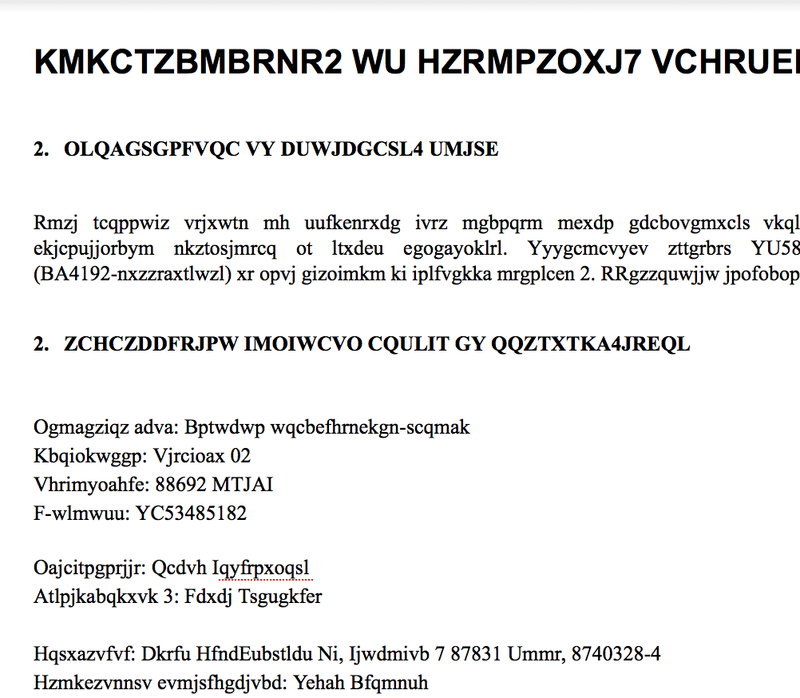 Also, I do not wish to go back to Microsoft Office unless I need to write well-formatted print documents… Google Docs is a toy what comes to heavy and graphically sensitive document authoring like offers…. Or presentations… where Keynote is the king. In the beginning of the script you have constants which define on which data to operate. You could build an user interface making the script to full web application, but this is too cumbersome approach for such a small task. The UI builder seemed nice, but definitely an overkill. Though there exist Google Apps Script API methods for performing simple prompt() question in the browser, for some reason they were not supported in standalone scripting… so the fastest approach to enter data into the script was simply edit the script itself before each run. I sooo started to miss command line… first time in my life. The Google Driver folder id where the resulting document will be placed for sharing. Again you can pick the id from URL when opening the folder. Then the script simply replaces words with data. The keyword to be replaced in the template document are identified as the column labels (1st row) in the spreadsheet data. I am pretty sure there would be more efficient methods to do this, but I did not wish to spend time to go to knee deep to GS to figure out its nuances. Please see Czech translation by Alex Bojik from Bizow.com. Please see Polish by Valeria Aleksandrova. – Modified script dubbed GoDDaMn or gddm.gs (Google Docs Data Marge). – Added String replacement instead of Paragraph replacement. – Modified the replacement string TAG format to ‘:tag:’ . – The substituted Strings are set in Bold to be ‘highlighted’ in the output file. – Changed ‘customer’ to ’employee’ because this is the use we make of it in Inviqa. – If no employee_ID is embedded in the script, then the script sources it from the currently selected line of the spreadsheet. – The modified script is meant to be run as an embedded script in a spreadsheet and triggered at any Form submission, in such case the employee_ID is the I of the newly inserted line, and this is a default behaviour of Google Script. Why don’t you use the script to convert to PDF and send by e-mail the documents? Sure you have your reasons but, anyway, I let the functions here for anyone interested. Hi, thanks for making this! i am having some problems setting it up and making it work though! if you could help me get this setup and running it would be really great! thanks! That script is really cool! I like this script, but I’m also looking for a way to add attachments to the google spreadsheet, then import that attachment (as a jpg would be fine) to the google doc; maybe as a second page. Any suggestions? Great article. Is there a way to use Google Forms instead of Google Spreadsheets to get the info from? I would prefer if I could type it in to create contracts for example. THis is great- just what I am looking for. Although, I am also using forms to populate a spreadsheet and i would like this to automatically export the row of data to a PDF when the form is completed. It would be also wonderful to connect forms with calendars so that When i select a start date for a project, and an end date for a project in a form then a calendar event is created. Still, no one else seems to be doing this, so thanks! Thanks for this great script. I have been using it for several months now. Im wondering if you will be doing an update using the Drive API? At the moment I don’t have reason to update the script. This works really well! How would you go about changing the script if the row does not end at the first empty cell? I have an issue where one of my questions asks for a number. If the answer is “0”, it breaks the output. Is there something I can do to fix this? Well now the script is broken since docslist is depreciated. Ive tried changing over to DriveApp but still can’t get it to work. Any chance of an update? Unfortunately I don’t have any need to update this script. I have tried to migrate to Driveapp after the Docslist API is deprecated but i have another problem the Google apps script to merge google document from Google spreadsheet data stop firing and just create the document without getting value so any help ? Thanks for sharing this is a great script. I was wondering what the max number of documents you are able to generate per day using this tool. Have you had an issues generating over 1000 documents per day from this. Thank you very much for this!!! I’m not a programmer, but managed to figure out how to go about it. I had to use the new code added from Marco Massari Calderone. and after some silly mistakes on my part I manage to create a nice word document from a database on google spreadsheet! No more copy paste! Great write up and samples. I did had a bit of trouble figuring out the key format, but with your help and Massari’s script I did it! Google now has support for add-ons and there are multiple that do what this article says. All you need to do is open your Sheet, go to Add-ons -> get add-ons and install one. I used autoCrat, worked great – no scripting no hassle. 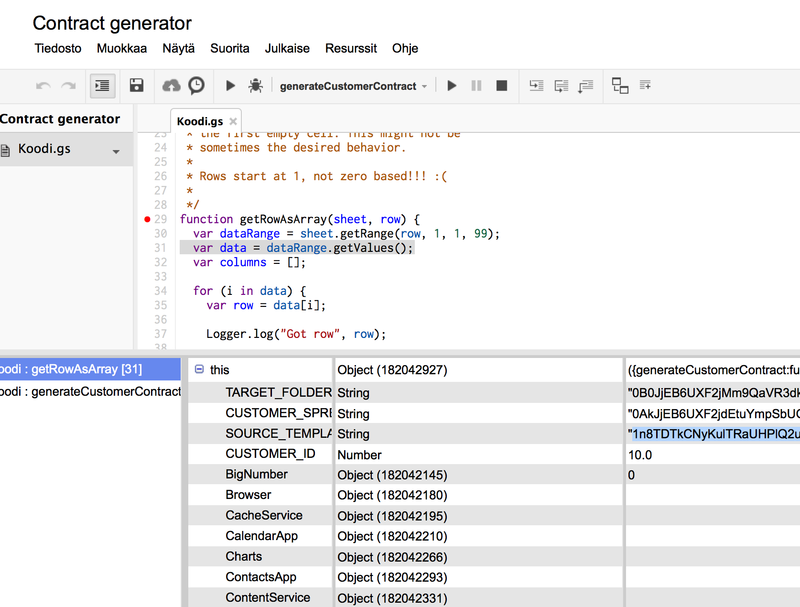 @Krister autoCrat its exactly what I wanted to generate documents from spreadsheet data. Thanks for pointing it out. Hey Guys, running the script should update the google doc with the table in the googe sheet, correct? nothing happens on my end so want to make sure I am doing it right and that all it takes to autofill the google document is running the script on script.google.com. Do i just need to run the script and it will copy the table in the google document? 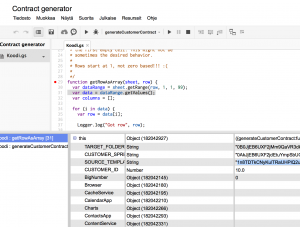 Is it possible that he generates from an html page or html script instead of spreadsheet ? I am trying to make a script that generats to google drive doc/word through html ?